Previously in this series I explored the functioning of a local council in the north Idlib locality of Killi. This time, I have turned to the south of Idlib province and have conducted an interview with the local council of Kafar Sijna, which is located to the northwest of the locality of Khan Sheikhoun. This interview was conducted on 18-19 October 2018 CE. Any parenthetical insertions are in square brackets. Q: Can you tell me a little about the locality of Kafr Sijna firstly? The number of inhabitants and the main families in it etc. A: The locality of Kafr Sijna is located in south Idlib countryside and it is a locality populated with around 23,000 inhabitants. It is composed of a number of big families like the al-Rajab family, the Ali al-Suleiman family, the al-Sabih family, the Rimi family, the Eisa family and the Abid family, of course with other groupings present in the locality. In the current time there is a large number of IDPs in the locality among them from Hama countryside and the displaced of Homs and the displaced of Damascus. 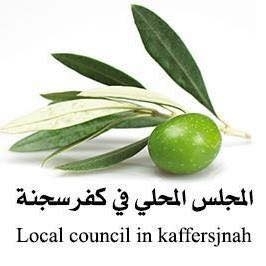 Kafr Sijna is renoned for cultivation of olives as two thirds of its lands are covered with olive trees. Q: When was the local council formed and what services does the council offer? A: The local council was formed since more than a year ago approximately. The local council offers many services to the locality like cleaning, education, relief and health. And it is considered the sole link between the peoples of the locality and the aid organizations. Of course the local council operates through its own efforts and modest capabilities in light of the absence of most of the aid organizations from the locality. And the members of the local council are volunteers to serve their locality without pay. The local council is affiliated directly to the Free Idlib Provincial Council, which is affiliated with the Syrian interim government. Q: What are the main accomplishments of the local council since it was formed? 1. Operating the water network in the locality of Kafr Sijna and repairing the lines. 2. Project of repairing 4 schools in the locality of Kafr Sijna. 3. Project of partial restoration of 126 homes in the locality. 4. Implementing the project of relief distributions to 1067 IDP and resident families at a value of $50 and for a period of 5 months. 5. Implementing small projects for 150 families, with distribution of greenhouses, sheep and cows. 6. Making job opportunities available to 120 male and female workers in the project of money for work. 7. Making available cleaning job opportunities to 13 workers for 9 months. 8. Forming a water unit in the locality of Kafr Sijna and securing job opportunities for 6 people. 9. Undertaking an agricultural project and giving agricultural baskets and agricultural distributions to 310 beneficiaries. 10. Implementing a project to repair the water network, and lowering a group of ground-wells and [installing] an electrical generator. 11. Digging a ground-well and preparing it. 12. Filling potholes in the main streets with asphalt. Q: What are the main problems from the realm of services in the locality? 1. Sewage system in the locality of Kafr Sijna needs expansion and repair of covers and restoration of inspection and cleaning rooms. 2. Problems of expansion of the water network and fuels to operate the network. 3. Laying the main streets with asphalt and opening new roads in the locality. 4. Repairing and restoring the services foundations on account of bombing. 5. Securing a compressor vehicle and cleaning containers in the locality and operating costs for cleaning workers. Q: How many offices are within the local council? And what are the divisions? In addition to the head of the local council and his deputy. Q: Are there elections for members of the local council? How are the members of the council chosen? A: Elections for the local council are carried out on an annual basis and the members are elected by the people and revolutionary actors in the locality. Q: Are there salaries for members of the local council? A: There are no salaries for members of the local council in the locality or they operate voluntarily to serve their locality. Q: Is there any national grid electricity in the locality? From where does electricity come? A: Electricity comes to the south Idlib countryside region through a humanitarian line and it covers the water stations and health centres and a large portion of the electricity for the people comes through amperes. Q: Do most of the peoples of the locality work in agriculture? Are there problems in agriculture because of drought? A: Most of the people of the locality rely on agriculture as a principal source of income for the family in addition to rearing livestock. Regarding agriculture there are no seeds of the good and excellent types. Also, there are no fertilizers and pesticides for agriculture and during the recent years there has been drought as well as the presence of many agricultural pests and vermin, resulting in great losses for farmers in the locality. Q: With which aid organizations have you worked? A: Ihsan aid organization, which has carried out more than one project in the locality, including relief and services; al-Bina' organization, which offered the project of partial restoration of houses and that covered more than 120 houses; Sadad organization has undertaken small projects in the locality; the Kids Paradise aid organization has undertaken among us three projects: distribution of greenhouses and distribution of sheep as well as a project to distribute chickens. There have also been other aid organizations among us that have been undertaking food distributions. Also the PAH aid organization offered an agricultural project and the Hay'at Sham al-Insaniya undertook a project to distribute cows to widows and the families that have handicapped people from widows and also the Violet aid organization has operated in the locality and offered two projects: the first was employing 120 workers in the locality, the second employing 26 workers- and most of them were working in cleaning and public services in the locality. The aid organization People in Need is currently undertaking a cleaning project in addition to covering the health centre in the locality of Kafr Sijna. Q: Have any factions tried to intervene in the affairs of the council? A: The military factions do not intervene at all in the local council for it is a civilian services council that undertakes its works independently of any military faction and the aid organizations have memorandums of understanding with the local council in the locality directly. Q: Are there any relations between the people of the locality and the regime? For example ID documents, from where do they come? A: The local council does not deal with the regime but regarding documentations and matters of employees with the regime, they are on a personal level between the employees and the regime. Q: From where does the financing of the local council come? Are there taxes, for example? A: There are very symbolic taxes that only cover the matter of cleaning. As for the rest of the services matters, they are through the aid organizations and projects, while those who work in the local council in Kafr Sijna do not receive any salary for their work because their work represents voluntary work in the locality.